The first baby Vic Vijayakumar ever held was his coworker’s child. 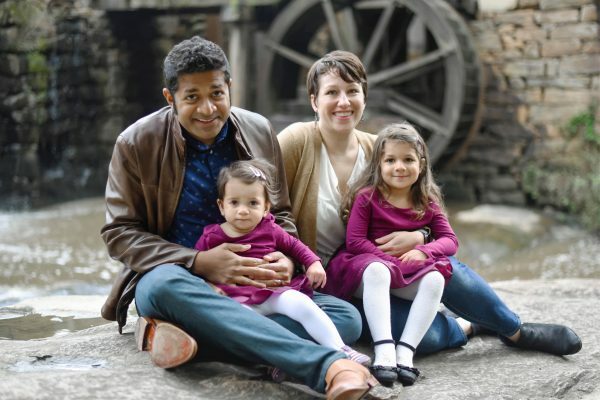 Vijayakumar, an engineer in the research and development division at Research Square, started working for the Durham-based academic author services company in 2007, eight years before he and his wife had their two daughters, who are now four and 18 months. And in many ways, Vijayakumar—the fourth employee of the now 300-person and growing company—says the family-friendly culture at Research Square helped prepare him to be a working father. Vic Vijayakumar and his family. Now that he’s a working dad, Vijayakumar says he hopes he can be a model to others. He says he makes sure to take time to care for himself and his family when needed, whether it’s taking his daughter to a doctor’s appointment or taking a mid-day run as a quick “mental health break” for himself, and he knows his coworkers trust him to get his work done. “I’ve got to imagine that my own behavior now will help someone else new to the company know that they don’t have to decide between work and family,” he says. Trust is a central part of Research Square’s workplace culture, says Amy Rawls, vice president of HR. In fact, it’s one of the company’s stated core values. “Our core values are very much in effect day-to-day, and they are very much lived out,” Rawls says. Many of Research Square’s benefits are built on that culture of trust, such as the open sick leave policy, which allows employees to take an unlimited number of sick days throughout the year to care for themselves or a family member during a short-term illness. Long-term illnesses or injuries are covered by other leave policies using a collaborative approach to design the right solution for leave. “We now have 300 people, and the number of times people have abused the policy is less than a handful,” Rawls says. Flexible work schedules and a wide use of telecommuting also are inspired by trust, along with the company’s focus on results-based work. More than half of the company’s employees live outside of the Triangle area and work from their home-base full time, and even local employees frequently work from home. Focus on flexibility is a recruitment tool that has proven very successful for the rapidly growing company, which added 99 employees last year and plans to add another 90 employees to their editing division alone this year, says Jessica Keough, recruiting and onboarding manager. As the world’s largest academic author services company, Research Square’s employees provide expertise covering 420 areas of study. Given the nature of the work, which typically requires a PhD or advanced degree in the field in which an editor works, the competition for talent is fierce, Keough says. Additionally, the company often benefits from the ability to recruit outside the Durham area for workers in highly-specialized areas. “Our flexible environment allows people to work around children’s school schedules, and that’s a real draw,” she says. As the company has grown, its leadership has made a concentrated effort to ensure that Research Square’s family-friendly benefits remain core to the business strategy, Keough says. In 2017, Research Square was awarded North Carolina Breastfeeding Coalition’s Breastfeeding Friendly Business Award, thanks in part to the company’s private, comfortable mother’s room, which includes a fridge and a drying rack for supplies, Keough says. This year, the company expanded its parental leave from three to six weeks—a change that was made in part as a response to employee feedback. Nearly one in three new parents (43 percent of women and 23 percent of men) in science, math, engineering and technology (STEM) careers switch fields, transition to part-time work, or leave the workforce entirely after becoming parents. Rawls, who has a PhD in Molecular Genetics, says Research Square offered her a chance to help other STEM workers find a way to balance their career passion and their family. Vijayakumar says he definitely wants to continue to work at Research Square over anywhere else. “I don’t want to find a different job and ask questions like ‘how are you going to deal with it when I need to pick up my kids from school?’ I want to be here,” he says.